Amidst shifting to my new place, a new job and a brief stay at the hospital, I craved for chicken wings… After probably 1 week of eating bland tasteless food in the hospital the first thing I wanted to have was sticky spicy hot chicken wings… So that’s what we did. We went to a local oriental resturant to celebrate our anniversary week. And thank god for those wings I got my lost appetite back. Unfortunately the craving didn’t just stop there. The taste was at the back of my mind all the time and I had to try my hand at cooking those mean spicy wings. I like to call them wings on fire 🙂 Like I said we are shifting to our new pad in next week and the house was in perfect mess when I found some time to cook..
Fortunately wings are fast to cook unlike other chicken parts. All you want for this recipe is some good cider vinegar, schezwan sauce, any other sweet and spicy sauce I used oriental sauce. 1. In a bowl mix vinegar, schezwan sauce and oriental sauce and cornflour. 4. Add salt to taste. 6. Add the sauce mix and Cover the chicken with half glass water with lid on it and let it simmer until the meat is cooked. 7. Add some paprika or chilli flakes if you want more spice. 8. In the end add some zucchini toss it till all the sauce blends with the chicken. 9. Add honey as per your taste at the end. 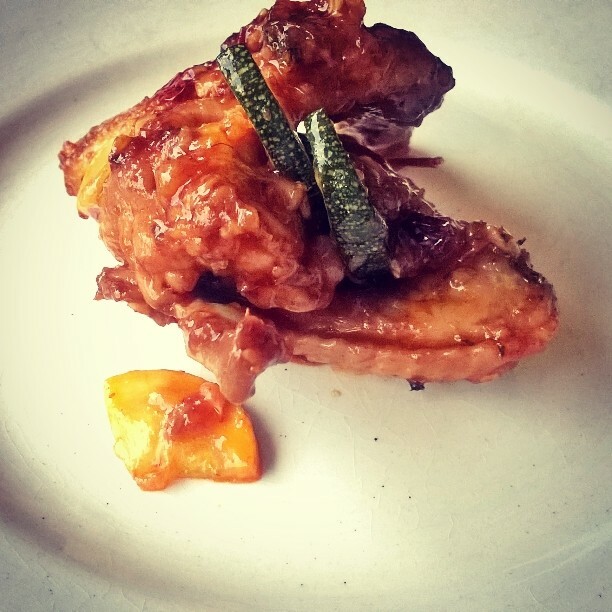 If you try out this sticky spicy hot and sweet wings let me know how it turns out for you. Mine was just like i wanted it to be. Weekends are soooo crazy with all week-long pending chores, groceries shopping for the coming week, especially when doing interiors for our new pad. Although it’s all very exciting, it leaves us no time for making meals that I fancy cooking for weekend. 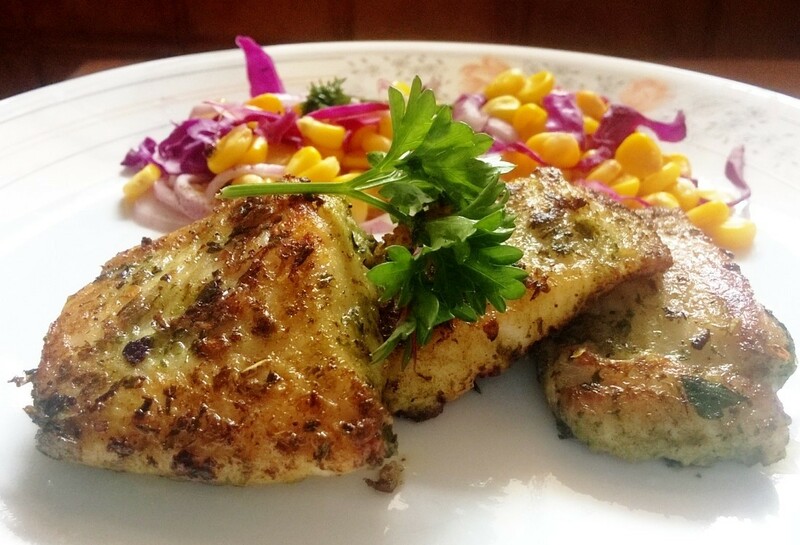 Not so long ago I told my husband about the lemon grilled Basa which I had on a trip to Delhi. I just went all gaga about it and he had no clue what was it all about. (The typical scenario where wife explains and husband doesn’t understand a word) I was amazed by it’s simplicity of flavors brought by classic seasoning of lemon & garlic, the lingering flavor it created was mesmerizing. I just fell in love with it. 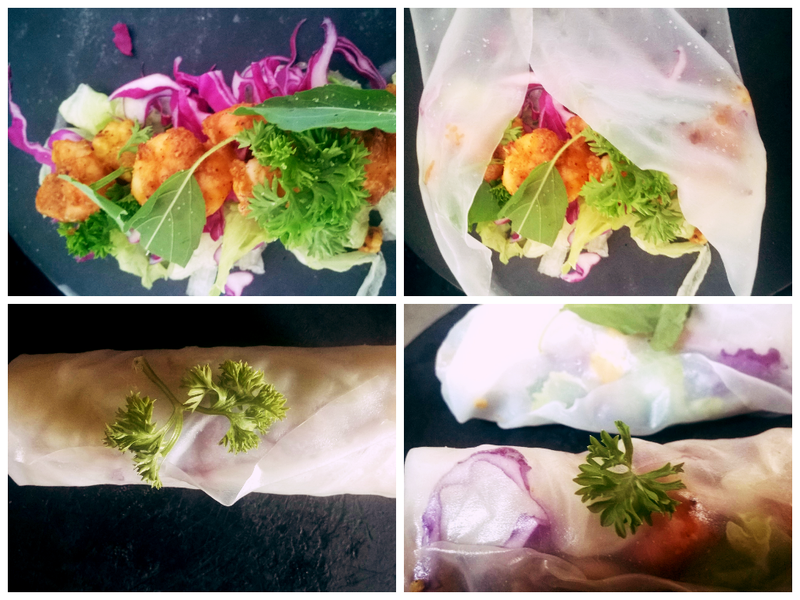 This week when I thought of doing a blog on Vietnamese spring rolls I went hunting for rice wrappers at supermart. I usually don’t visit the cold storage section of supermarkets for buying fresh fish or meat simply because I think its costly as well as there is no fun in buying without bargaining, like we do with kolis(fisherwomen) at local machi(Fish) market. I managed to find great quality Shrimps for my planned spring rolls and Basa fillet caught my eye. I couldn’t resist the fish in the cold storage and had to land it on my tawa soon. I personally can never imagine Basa in an indian spicy avatar like our Surmai or Pomfrets are dressed. This fish is awesome when grilled with minimum spices and flavors. Although it’s a bit heavy on the pocket but I am sure you won’t regret buying it if you try the recipe below. Step 1: For soaking the Thai Rice wrappers you will need a huge vessel, would be better if it’s the size of the wrapper. I used my kadai for this purpose. Fill the kadai with sufficient water and dip the paper one at a time. Step 2: Take a dry towel and let the wrappers dry off its excess water on it. Letting it stay for 5 mins would be sufficient. Step 3: lift the paper with both your hands and handle it delicately as it will be softer. While lifting it up, if the paper starts getting tangled don’t panic. Use a little water in that case. Step 4: Arrange lettuce leaves, cabbage, carrots and shredded omelet. Step 5: I used some Delmonte oriental sauce(you can use any sauce of your choice just a Tspoon will be enough and this is optional) to sauté Shrimps as I don’t like them plain which is the usual traditional recipe. Step 7: Fold from the sides first as shown in the pic and then roll it. Serve it cold with Chilli sauce. Curry leaves, parsley, Sweet Basil (1 cup) made into a coarse paste. Step 1: Wash the fish and drain access water from it. Step 3: Further marinade the fish with curry leaves, parsley, basil paste and some chilli flakes. Step 4: keep aside for an hour. Step 5: Sprinkle dried herbs before Shallow frying in a non-stick pan. The Fish would take approx.. 5 to 10 mins to cook. 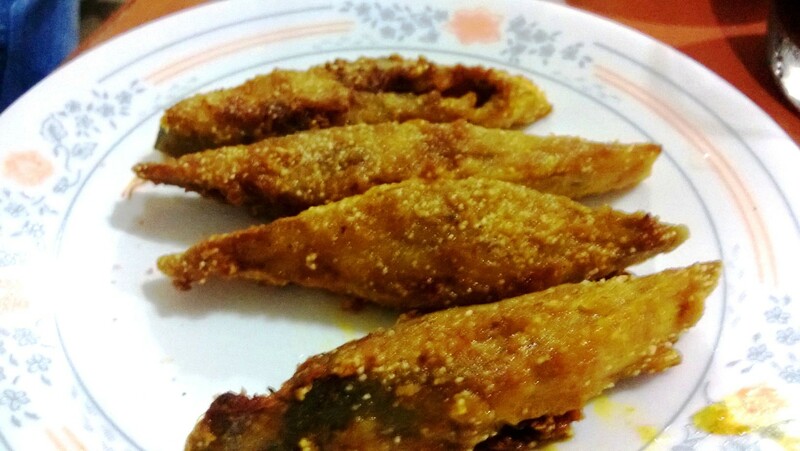 Let it fry till golden brown from both the sides. Serve with some steamed veggies. My last post was 4 months back and if you’re all wondering what’s keeping me busy these days, as much as i hate to say this its the new project at work which is taking away all my time and energy. Even if I cooked something which I want to share with my fellow bloggers and friends, me and my husband(its usually him) hogs it down so quickly that by the time I fetch my camera I find only the remains of once a beautifully and passionately prepared dish. Few days back I met somebody who is fond of my blog and asked me why I wasn’t posting anything. That’s when I realized how much I missed blogging and want to make sure that I shall find time for this passion whenever I get some time. So today I am sharing a simple breakfast recipe which I wanted to try since a long time. 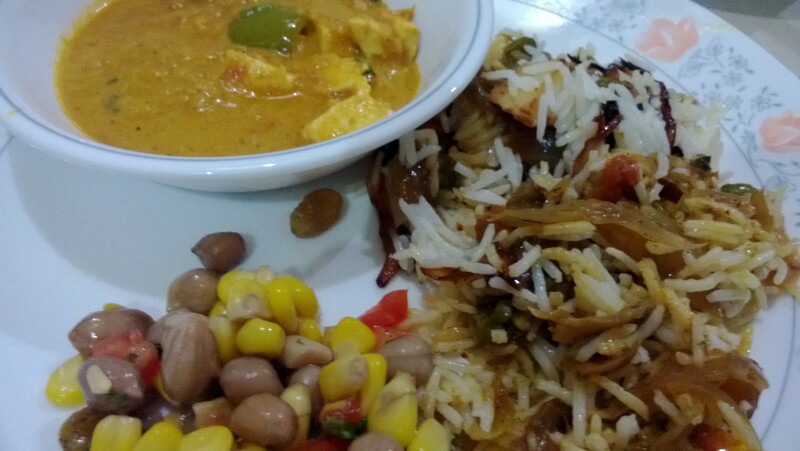 As the month of Shravan has started we have abandoned non vegetarian food. And to imagine pancakes without eggs is very difficult. But I have always learned from my experience that there is always a way and substitutes for ingredients that you will find in your kitchen. 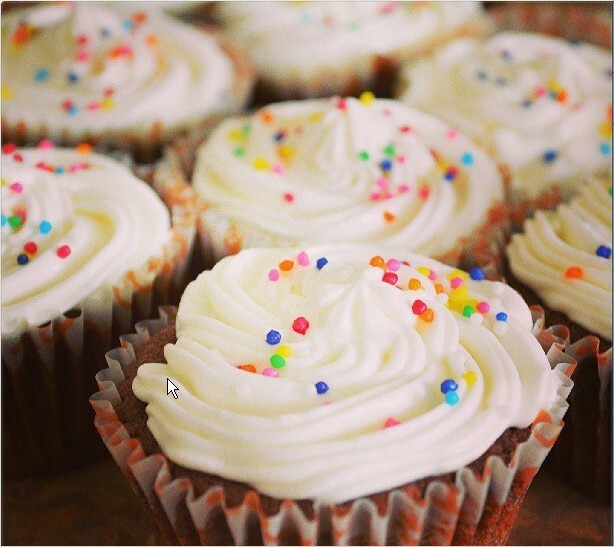 Mix flour, salt, sugar, cardamon powder, milk and make a thin paste. Add milk as per the consistency required. I like my pancakes thin and crisp so the consistency of the batter is thin. Add chopped bananas in the above mixture. And save some for garnishing. Heat your nonstick pan and add the butter. Once the butter starts melting add it to the batter and mix well. Using a round spatula make medium size pancakes and spread it evenly. Flip the sides and make sure its evenly cooked. The aromas of banana mixed with cardamon will quickly fill your kitchen. 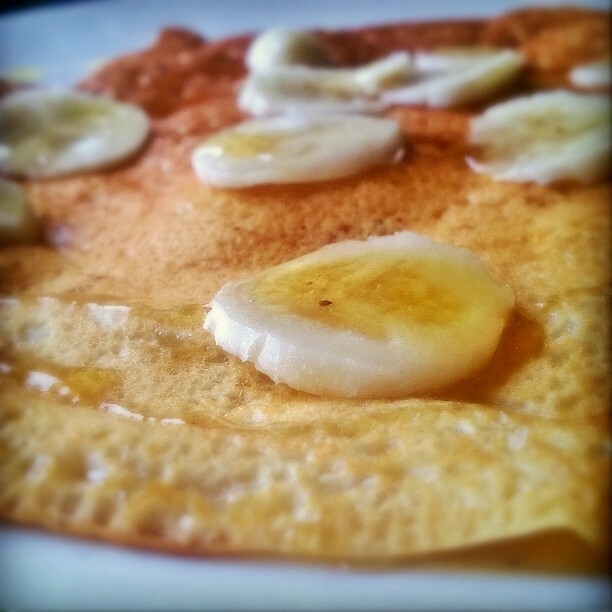 Garnish your golden brown pancakes with bananas and honey. Instead of honey you can also try hot melted chocolate or maple syrup. I don’t remember when my fascination with barbeque started. I always wanted to buy a small barbeque grill. Almost two years back I went shopping along with my Husband for a wall clock but instead bought a barbeque grill. We were so excited about it and were eager to start grilling right away. We didn’t bother to go through the manual or read the process of grilling using charcoal. So there we were, stuck, applying all the logic but something was definitely going wrong and it all ended up in a mess. Finally the barbeque grill was shut, wrapped and sealed and kept in a corner. I thought it’s not going to be easy preparing barbeques. As for us Mumbaikar’s, fetching an outdoor location without disturbing the integrity of the neighborhood with the smoke from the grill and of course keeping away the ‘Un-invited’ with all the tantalizing aroma is next to impossible. A few days back on our wedding anniversary we visited the Kebab Village(Kumar resorts, Lonavla), where we had all our favorite kebabs possible. There I realized, I HAD TO grill one back at home, no matter what. Hence, we started off with buying sufficient coal for our barbeque grill (almost half a kilogram of coal) and borrowed some kerosene. Apart from all the ingredients the most important ingredient you will require is some patience. Probably when the coal is heating up. But once it is hot, half the work is done. 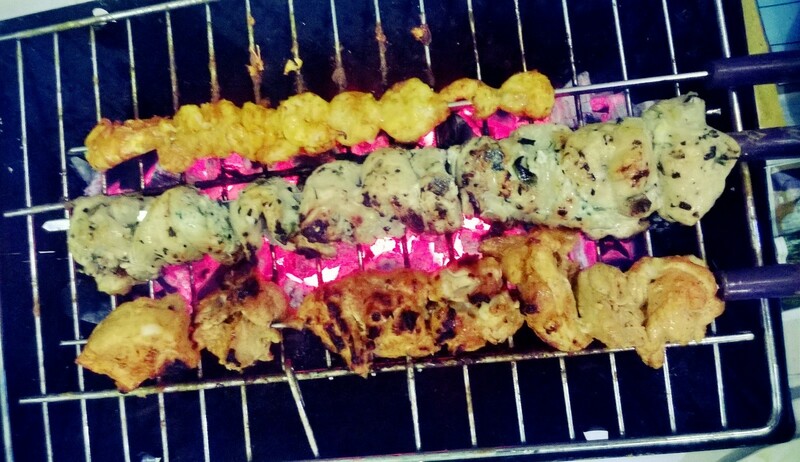 On the personal front I am still a newbie and need a lot of expertise till I can call myself a good barbeque griller. Yet I am excited to share my first-hand experience with all of you. So we prepared Tandoori chicken in red marinate, black peppered kebabs in white marinate and finally some prawns with a simple marinate of red chilli powder, turmeric powder, salt, some lemon juice and crushed garlic and some corn flour was added to thicken the marinate. Use boneless chicken pieces for this preparation. Marinate the chicken for 4 to 5 hours maximum. Maintain 2 sections on your barbeque grill, a section with high heat and a section with low heat. Start putting the chicken on the skewers and then on high heat until the outer skin is cooked. For cooking the inner meat, you will have to transfer it on a low heat section. So the inner meat keeps cooking slowly without burning the outer skin. You have to keep rolling the kebabs every minute or two so that you dont burn it on one side. Keep brushing some melted butter or any barbeque sauce you prefer. Like this you will have an absolutely soft meat on the inside and the lingering charcoal flavor on the outside. The kebabs were ready in approx. 10 to 15 mins. So weekends are time for long elaborate breakfast.. breakfast which begins late and ends till lunch.. and so we usually skip our weekend lunch and laze around on afternoons..what is best about these soft pancakes is its packed with proteins and other essential nutrients. 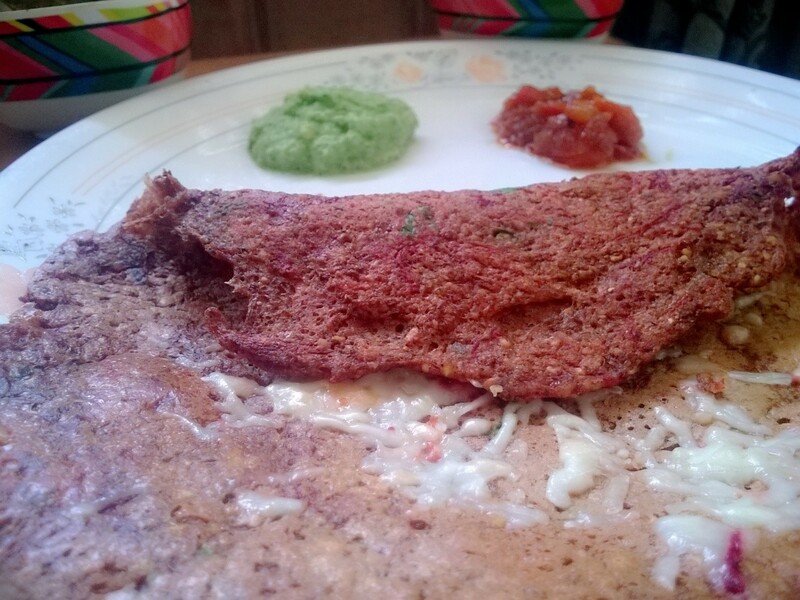 Moong chilla is our favourite Saturday breakfast recipe. For moong chilla you have to soak moong for 3 to 4 hrs until it becomes soft and a smooth paste like consistency can be formed. I usually mix 2, 3 types of dal together for eg you can mix moongdal and moong, or masoor dal too. In the pic below I have used masoor and moong. Usually we mix finely chopped onions and chillies in besan chilla. 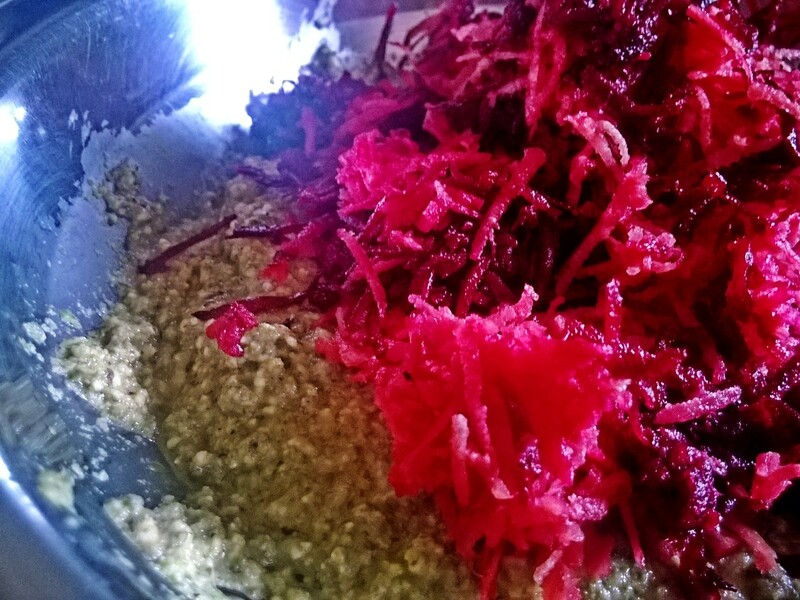 But as this particular chilla is full of proteins i thought of making it a bit more healthier by adding some grated beetroot and carrots. 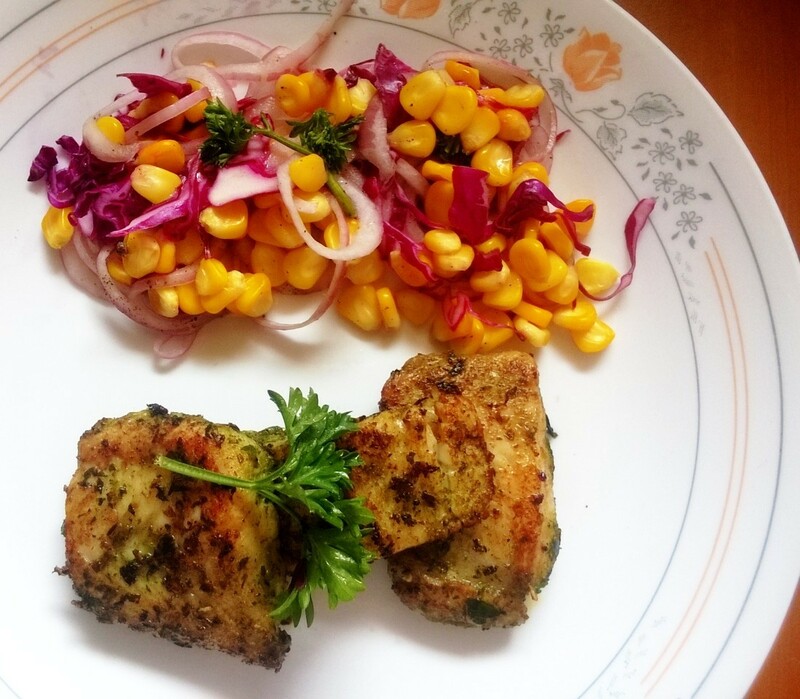 So here is the recipe for healthy moong chilla with betroot and carrots. the remaining ingredients. If you want a thin crisp chilla you can add water and 1 or 2 tspoon suji. Take a nonstick tava and heat it moderately. Pour some batter on the tava and spread it with the help of a spatula. You can add some oil on the borders, But it is not required if you have a good non stick tava. For garnishing i have added some grated cheese but that is totally optional. 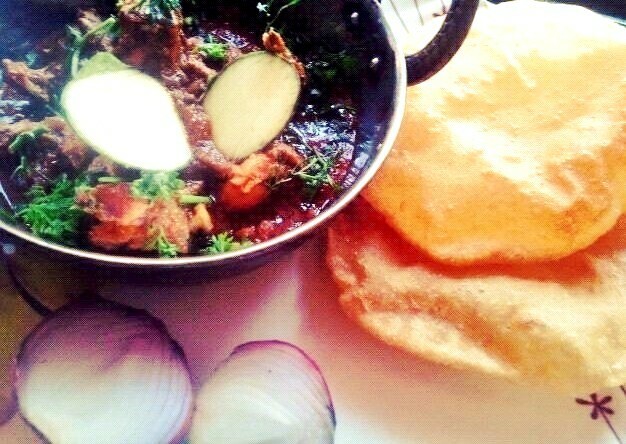 PS : In the pic i have served the chilla with corainder and tomatoe chutney. Bittergourd !!!!!!! Not so bitter.. Cooking any bitter gourd recipe and feeding it to my husband is quite a challenge. Like most people my family is also not so found of “Karela”. so that’s how my journey begin to try a recipe which would change everyone preconceived notions about bittergourd. 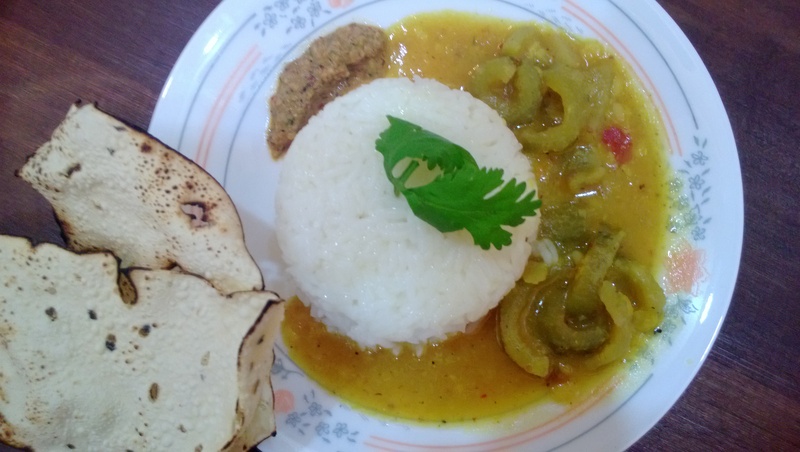 This version of bittergourd is a south indian style spicy, tangy and sweet curry made with coconut and toor dal, which i found on a blog long time ago but i have no clue about the real name of this recipe. So here goes the recipe. Wash mung dal / toor dal or the dal mixture well. 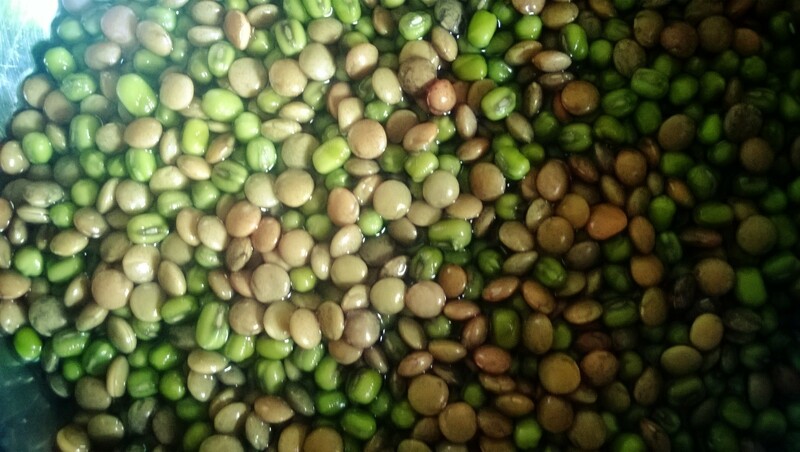 Wash and soak tamarind in warm water for 10-15 mins. Pressure cook dal for 3-4 whistles or until well cooked. Wash the bitter gourds. Slice the ends about 1/2 cm, slit them in half and scoop out the seeds. Then slice them into thin half moons about 1/2 cm thick. In a medium-sized heavy bottom pot covered with lid, cook bitter gourd slices in just enough water, until soft but not mushy. Squish soaked tamarind to pulp and pour into the pot. Season with salt. Dry roast While it simmers, get the masala for the gravy ready. Place a kadai over medium heat for dry roasting the spices. When the kadai is hot enough, add few drops of ghee, drop in the black peppercorns and roast until they just begin to splutter. Remove onto a plate. Add urad dal, red chillies, curry leaves and roast on low to medium heat until urad dal turns golden brown and curry leaves are crisp. Switch off, add hing and grated coconut and sauté until coconut is light brown and smells toasty. In a blender, grind the roasted ingredients along with some water to a smooth paste. Pour this paste into the simmering pot of tamarind and bittergourd and stir to mix well. Whisk turmeric into the cooked dal, stir to mash well and pour into the pot with cooked bitter gourd. In this small chirpy town of Baroda or Vadodra as they say it, where majority of the population is vegeterian but you will still find its share of eggetarian roaming around this side of VIP road, Karelibaug and the reason is Raju omelette. 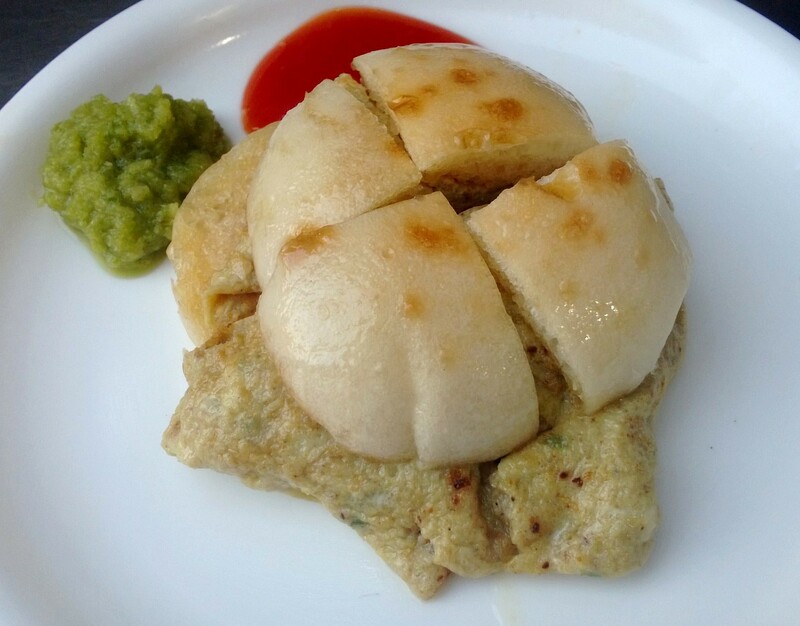 I went through the menu list on the wall and it starts with Rs 65 for a omelette pav which is also quite costly according to mumbai standard and it makes me wonder what is so special about it that people are willing to pay more than 100 bucks for a variety of egg dishes. I mean how creative can you get with eggs. The menu list is not too long, But you will still find each dish different from the other. The answer is the huge fan following and also the trust in quality which is being served for more then 2 decades. The kitchen is sparkling clean (which even puts me to shame :P) with around 12 to 15 people managing the kitchen yet people are standing and eating and they dont seem to mind at all. I hear another outlet of Raju Omellete opening in Dubai and also getting awarded best road side eatery for Times Now Foodie award, its a huge acheivement for 51 yr-old Rajesh Bhogilal Rana better known as Raju after whom the joint is named. So finally after lots of planning over the last few months Chhaya and Jay came over for dinner. Chhaya is a school friend and our friendship goes back to more than 15 yrs. She got married just 15 days after my wedding and since then we both have been busy in our lives..just like i have found my passion in cooking she too bakes amazing cakes.. I wanted to make something simple and something which keeps the conversation going kind of food. 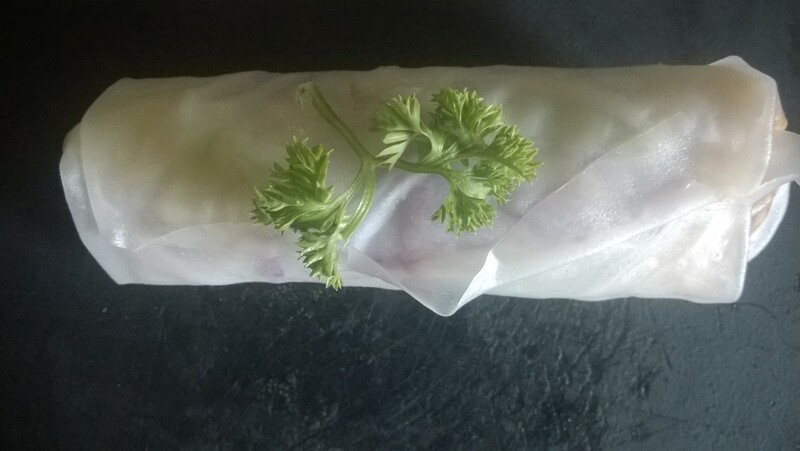 So i started with some crispy beetroot rolls and after reading my blog on lemon fish fry she wanted to try it. I made my husband do the marination part because he is very good at it and knows exactly what will bring out the flavours. 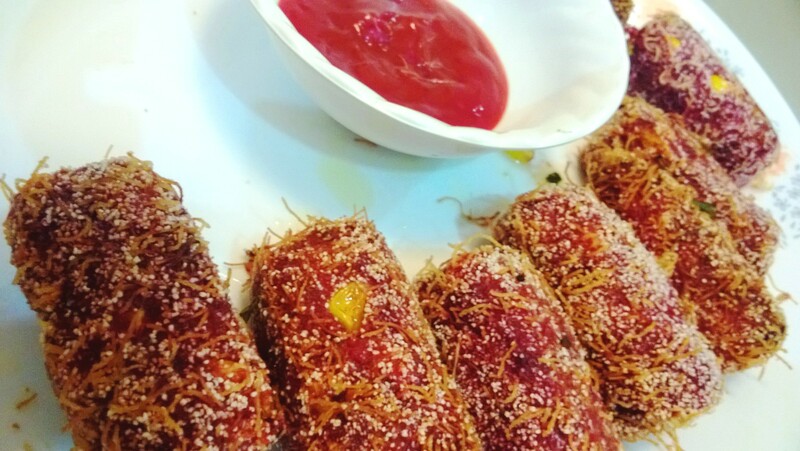 The beetroot rolls came out really well with a crispy coating and softer mixture underneath which were rolled in vermicelli and deep fried. mix all the above ingredients and give it any shape you like. roll them in vermicelli and semolina and deep fry. Put them on tissue paper to drain the excess oil. So its finally raining cats and dogs and every time it rains i have to churn out some hot crunchy snack for my husband which is a compulsion now.. i wonder how potatoes create their magic in every other Mumbaiya snack be it Vada Pav, Aloo bhaji etc. Personally i avoid fried potatoes but rains are the perfect excuses to chuck out all your diets. 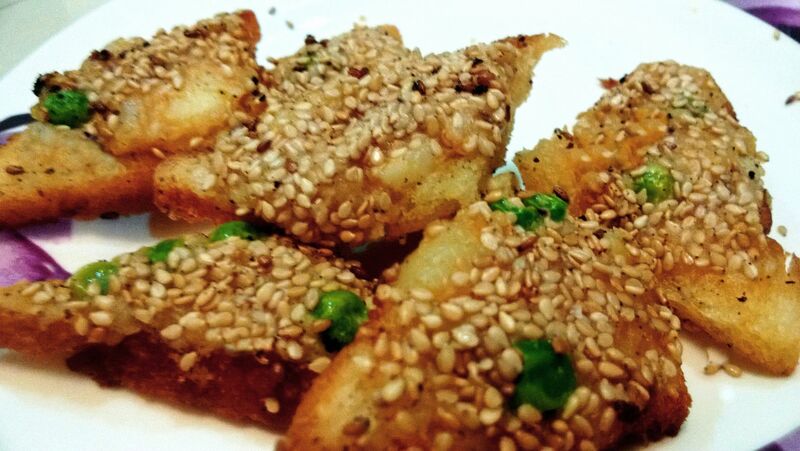 so here is this filling snack made of potatoes and peas toast fried with sesame seeds. Boil the potatoes, cut the potatoes into small pieces. Pour some oil in a pan and add the potatoes and green peas together. Add all the sauces together and let it cook for some time. best part about this recipe is you can mix any kind of ingredients like corn and potatoes, chicken and corn, prawns and peppers. take some breads cut it into triangular shape or round shape as you like it. Place some potatoes peas mixture on the bread and sprinkle the sesame seeds on the toast. Tangy Spicy Chicken made in Mango Curry. Finally rain has arrived and so has the king of fruits. Our beloved Hafoos, Payri (local mango variety) are missed and craved around the year. Nothing can beat Aam ki Pyaas. Raw mango has already arrived a month back and our moms are busy making Achars and Murabas which will be stored and used for 2, 3 months. Every household has a traditional special dish made from mangoes which is passed through generations. This is one of those special dish which we make at least once during the mango season. Put 3 tspoon oil in a cooker, add bayleaf, cloves, peppercorns. Add thinly sliced onions and cook it till it gets brown. 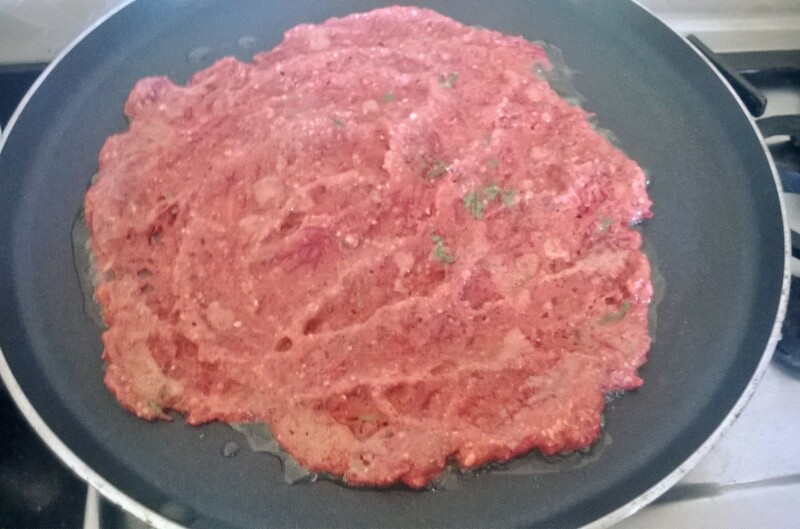 Add ginger garlic paste, chilies, finely chopped tomatoes , chopped raw mango and garam masala powder. Saute it till the tomatoes and onions are well cooked and starts leaving the oil. Lastly add the chicken and salt as per your taste. Add some water and close the lid of the cooker. Allow it to simmer for around 10 to 15 mins. Try this dish with Parathas or Naan (Indian breads). Here in this image you can see Bidari Paratha which is a deep fried paratha.